Send a photo card to your friends and family this season with a current 2010 picture of your family or your children. These types of photo cards are perfect for Grandma's and Grandpa's who live afar. 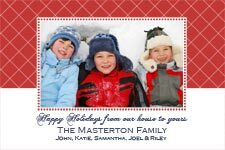 It features a single family photo which is the main focus of the photo card set on a blue and white patterned background. 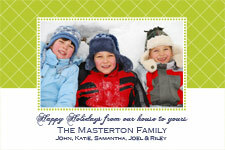 The greeting "Happy Holidays from our house to yours" is written in scripted text and is followed by your Family surname. You can choose to list your family members individually below. You can also change the colors or card wording or even use this card for your Holiday party invitation. This photo card is pictured below in red and green. Just add the details to the form below and hit send. You can print off as many copies as you like at your photo lab or on your printer.